A profusion of Pats is one of the simplest problems St. Matthew Catholic Church in Charlotte, N.C., has to grapple with. 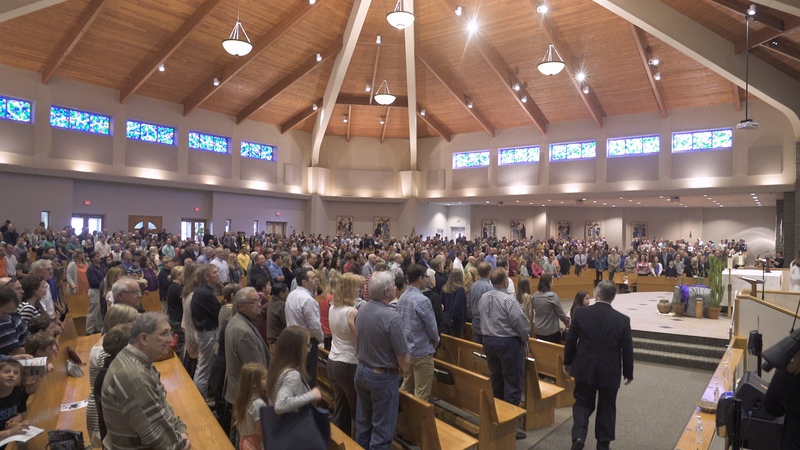 Thirty years ago, St. Matthew had only 237 registered families, but the church has mirrored the explosive growth of Charlotte and now serves over 10,000 registered households, putting it in contention for being the largest parish in the United States. Meanwhile, according to a 2009 study by the Center for Applied Research in the Apostolate, the median Catholic church in America has 761 registered families. That means everything about parish administration at St. Matthew has to be larger than usual. Some 600 to 700 children receive first Communion together in a single weekend over four Masses. Up to 21 extraordinary ministers of Holy Communion line up at numbered stations during Mass (each with their own hand sanitizer dispenser). And over 7,000 volunteers help to run 103 active ministries. The ushers that Mrs. Barlett recruits and supervises help the parish keep statistics on their numerous sheep. At services, they stand by the doors with clickers tucked unobtrusively in their pockets, to let them tally the number of people walking through. The headcounts give the parish a way to keep track of ebbs and flows in Mass attendance, as well as to gauge the popularity of other events. 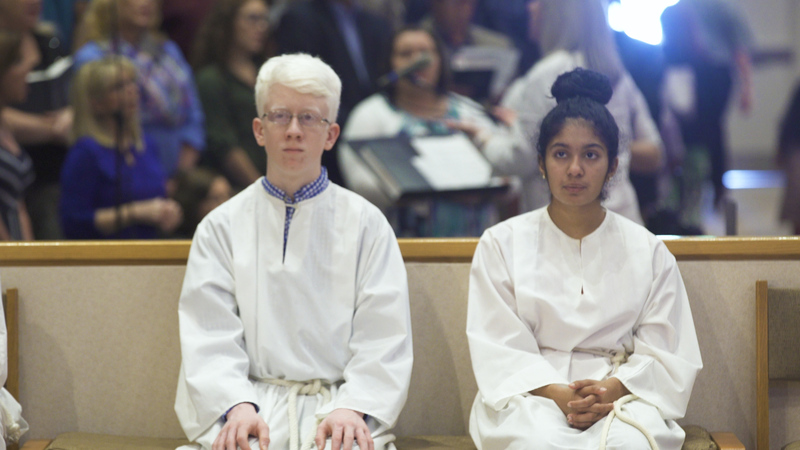 The day after I left Charlotte, St. Matthew began a three-day healing ministry, led by a visiting priest, that it was repeating partly because of last year’s success in drawing people in. It is just as crowded beneath the church as it is upstairs. In the basement, there is a huge space for food, clothing and other supplies collected through the church’s various donation ministries. “I can’t believe you have a warehouse down here,” I exclaim on the tour, only to be corrected with a smile by Antoinette Usher, the facilities manager. “No, our warehouse is at a different site.” To suit the needs of that location, the church has purchased its own forklift. While other parishes are limited in what they can store or what projects they can take on, St. Matthew strives for an economy of scale that allows it to have something at hand for every need, whether physical or spiritual. St. Matthew has looked outside the Catholic tradition to figure out what comes after the welcoming ministry. According to the Center for Applied Research in the Apostolate (CARA), less than a quarter of all Catholic churches built since 2001 seat 1,000 people or more, while St. Matthew has room for 2,000. There just are not that many megaparishes to learn from. That is why Michael Burck, who manages adult faith formation, and some other St. Matthew staff members took a trip to Saddleback, Rick Warren’s evangelical megachurch with more than a dozen sites in California, to see what lessons a Catholic parish could draw from a church that differed in theology but was more similar in size. Mr. Burck was struck by the way evangelical churches are empty during the week and wondered where all their parishioners are going. The parishioners at Saddleback gather on Sunday to have the Scriptures read and interpreted, but for the rest of the week they pray together outside the church in small groups. Those small groups take Sunday services as a point of departure, an approach Mr. Burck views with a kind of holy envy. “The Sunday talks are content for the small groups but they’re 30 to 50 minutes,” he explained. “We have Mass.” Since homilies are related to the week’s Scripture reading and cannot always serve as the main starting point for discussion, a small group at a Catholic church requires more planning. I think this is going to be the model parish in the future; you’re not going to see a church on every block or every town. St. Matthew took another cue from evangelical megachurches when, two years ago, the parish opened a satellite church, which they call their South Campus. The second church is located 10 miles away from the main complex, and it is intended to serve families who might otherwise struggle to make it to church from their homes. “Who would drive 30 or 45 minutes to Mass with small children?” Monsignor McSweeney asks me. St. Matthew already runs multiple Masses at 10:45 every Sunday morning at the main campus. One takes place in the main church, which seats 2,000, while the second occurs in the school gym. South Campus allows the parish to squeeze in two more Masses. South Campus offers only Mass and catechesis. For anything beyond sacramental preparation and the sacraments themselves, the parishioners need to drive over to the main campus. 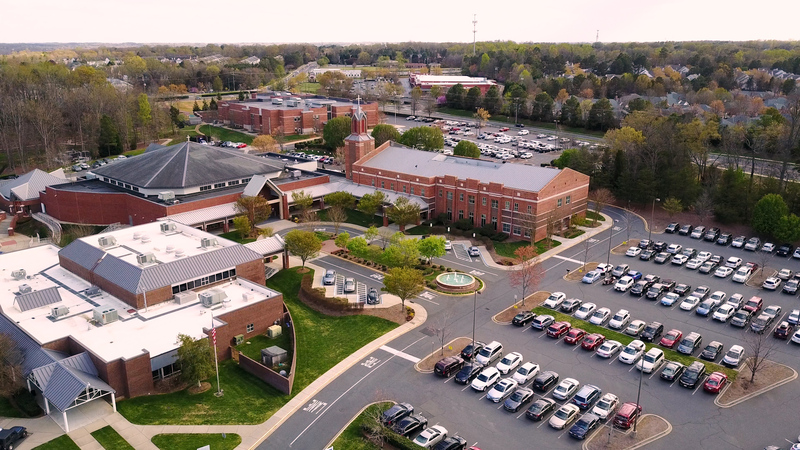 By offering only the essentials at South Campus, the parish staff hopes to keep the Mass-goers at the satellite campus connected to the rest of the community. Beyond the church itself the sprawling campus of St. Matthew look like any school or office building. Plain doors open to rooms with fluorescent lights. But in the otherwise anodyne hallways are huge posters of illustrations from the Baltimore catechism. They were taken from a donated catechetical flipbook and repurposed to give life to the corridors. There is also a crucifix in every room—or nearly every room. Antoinette Usher, the facilities manager, explains that they always have to raid the meeting rooms for Veneration of the Cross services on Good Friday. “We couldn’t do it with only one cross, it would take forever,” she tells me. So priests grab extras and station themselves around the church. It takes a little while for all the borrowed crucifixes to find their way back after the service. Keeping track of the parishioners is even harder than keeping track of the crucifixes, so the parish has turned to surveys and statistics for new ways of measuring its spiritual health. St. Matthew partners with Gallup and with CARA to conduct two different in-pew surveys. They administer the surveys on an alternating schedule, so they always have fresh data from one of them. The CARA survey allows them to get more granular data and to focus on specifically Catholic questions (e.g., parishioners’ understanding of what the Eucharist is). Gallup’s Member Engagement Survey is offered in churches of different denominations across the country. The 25-question survey includes questions about engagement, spiritual life, and general life outcomes and satisfaction. When the numbers come back, the results are shared alongside the pastoral plan with ministry leaders, followed by breakout sessions to think about what the church could or should do differently. Brooke Moran finds that the surveys allow the parish to have a more nuanced understanding of the spiritual health of the parishioners. “Some parishes give a state of the church by how many take communion. I look forward to the engagement numbers,” she says. I ask Don Garbison, who manages the small groups program, which five Gallup questions have done the most to inform his work with the parish. He chooses questions that ask parishioners if they feel they have the opportunity to do what they do best, if their spiritual needs are being met, whether they know what their parish expects of them, whether they feel their opinions count and whether someone in the parish has talked to them about their spiritual practice. From survey responses, the parish staff gets a better idea of whether a particular program is working. Members of small groups at St. Matthew are much more likely to indicate they feel engaged than those who are in larger groups or do not participate in groups at all, but it can be hard to tell whether the small groups are causing engagement or just attracting the people who are most engaged already. As a statistician, I know that every survey can limit a story as much as it illuminates it, so I ask leaders of St. Matthew’s ministries what they felt could not be captured by the numbers. Mark Schuler, the chairperson of the parish council, immediately mentions the limitation of in-pew surveys, which cannot capture the people who do not attend Mass regularly. Gene Francisco, who works in the mental health ministry, worries that the marginalized, especially those with mental health issues, may be the least likely to fill out the forms, even if they are present to be surveyed. And Jane Francisco, Gene’s wife and the leader of home ministry, would love to be able to hear more from young people at Mass and from children at St. Matthew’s school (because of concerns about privacy and consent, the survey is given only to those 18 years of age or older). If he could add questions, he tells me, he would like more about parish life, and “given the importance of the Eucharist,” more questions about Mass. What he wants most is a way to get more details on the people who do not consider themselves to be engaged. One Mr. Ahn’s new projects to help young adults find a home at St. Matthew is a ministry for new families. I attended the second-ever meeting of this ministry in January after Mass. The attendees include longtime parishioners like Patrick, who has belonged to St. Matthew for 10 years and met his wife through the church’s softball team, and David, who moved here only two years ago. Mr. Ahn calls the room to order and explains a little about what the group will be doing that day (sharing breakfast and chatting), when he is interrupted by his 3-year-old nephew, who runs up to the front of the room, grabs the mic and yells, “I went potty!” The room politely applauds, and the little boy walks back to his seat, clomping happily in his Batman galoshes. Mr. Ahn’s nephew is the most excitable (once the announcements are over, he tries to walk off with the mic stand, which is taller than he is), but there is at least one child at every table, many of them babies alternating between gurgling and trying to steal their parents’ plates and throw them on the floor. These are exactly the kind of people that Beth Haemmerline, an Army veteran, and her husband have came here to meet. She had visited several parishes before joining St. Matthew officially with her husband as part of baptism preparations. She tells me that she was “scared at first” by the size of the church, but she joined the young families group in the hopes of finding friends “who understand canceling social plans when the baby doesn’t sleep.” With St. Matthew’s size, she says, she can can trust that she will find someone else in the same position. She just needs the right ministry to draw them together. Pat Tomlinson, St. Matthew’s director of religious education says that she benefits from the wide range of people who belong to St. Matthew when it comes time to fill out the ranks of catechists.She got involved with the parish when she volunteered with the confirmation program in 1994. Back then, the parish was only half as big, but as a volunteer, she says, “It was so disorganized and it drove me crazy.” She went to the pastor and said, “I don’t want to be paid, but please let me get this thing organized.” She volunteered until 1998, when the pastor asked her to take over as D.R.E. until a new one could be found;, the “new one” turned out to be her. She surprises other D.R.E.’s with how easily she finds teachers. She has found 592 people to teach this year, which makes it possible for her to have two adults per class of about 16 young people. Meanwhile, she says, “My friend at St. Vincent’s has trouble getting 32 catechists—32!” Her only recruiting problem is finding more men to serve as catechists, but they are now up to one-fifth of her teachers after being virtually nonexistent when she started. She is reaching out to the many stay-at-home dads in the community, some of whom have moved to Charlotte because their wives were offered jobs here.Ms. Tomlinson finds a place for these men because there are enough to think of them as a whole group to be served (with a particular opportunity to serve others), not just as a few lonely individuals. But the ministry that seems to benefit the most from St. Matthew’s size is the bereavement ministry. In such a large community, there is always a family touched by loss. In a usual week, there are one or two funerals. So once or twice a week, the bereavement ministry steps in. The ministry pairs families with volunteers, who help the family make all the liturgical choices required for the funeral Mass. If the family is having a funeral reception at the church, the bereavement ministry will set up tables, make all the food needed and clean up afterwards, all for free. Afterwards, a volunteer reaches out at least once a month for a year following the death. It is the bereavement ministry that sticks with me after I’ve left St. Matthew. It is still hard for me to imagine joining a church that large, a church spread over two campuses, but the singular grace of a megaparish is one I hadn’t expected: There are too many people for anyone to carry a cross alone. The most striking economy of scale in this megaparish is the response to suffering. No matter what the struggle, it can be shared by a sizeable number of people at St. Matthew, just because there are so many people there. Frequent funerals call forth a robust bereavement ministry. Fathers feeling at loose ends at home become catechists and meet other men in the same position. Parishioners struggling with mental health prompted the creation of a counseling center overseen by Sister Eileen, a Trinitarian nun, that’s open to the whole neighborhood, not just parishioners. The most significant challenges, perhaps, for any parish is figuring out how to care for the people it is meant to serve. At St. Matthew, those challenges grow in scale, alongside the warehouses and ranks of ministers. But at least sometimes the scale becomes a grace as well, as it leads to opportunities to care for people carrying a particular cross in a sustained way. While these responses may leverage the scale of a megaparish, they are built on the same foundation of personal connection and direct ministry that any parish at any size requires. I don't think I'd like being a member of a parish as large as St. Matthew's. As I read through the extra long details of its operational evangelism, scanning parts of the presentation as I found it somewhat dizzying, I began to get a picture of a big business enterprise, a corporate scent and for a parish that large I guess you need that kind of structure. Maybe I'm entirely wrong, but it made me feel uneasy, but hopefully may the Gospel truly prosper. “Who would drive 30 or 45 minutes to Mass with small children?” Monsignor McSweeney asks me. A number of large families travel an hour each way to attend the Latin Mass at my parish. Only by the Grace of God would this article appear now. It turns out that I am moving from Carlsbad, California to Charlotte, North Carolina next month!! In particular, I expect to live near St. Matthews. About six months ago I visited the Church on a trip to Charlotte. It is a large, beautiful Church and the people are friendly and welcoming. When you enter the Church's vestibule there is a information counter with someone who will answer any question you have and give you things like who to contact to be a member of the Knights of Columbus. I am quite excited to join the various ministries at this parish. What a coincident, or perhaps there is a message for me here. Wish me luck. Welcome to Charlotte Michael. As a child I started to celebrate mass in the movie theater and was confirmed in the "new gym" over 25 years ago. Now with 3 children baptized at Saint Matthews, I still feel like I belong to a community and I am always surprised when I hear I go to the largest parish in the United States. There is opportunity to join multiple groups or activities that speak to you and your faith journey. I certainly hope this is NOT a model for the church of the future. Why is there just one parish serving over 10,000 families? BECAUSE THERE IS A SEVERE SHORTAGE OF PRIESTS! Jesus with his apostles and disciples gathered around a table for the "last supper" is a much better model and becomes an intimate sharing of our intertwined lives and spirit. 2,000 people at Mass presents all kinds of logistical issues including long communion lines, large separation from the altar and liturgical ministries, and the usual effects of a large crowd - coughing, crying, pews crashing down and "back-benchers" trying to stay under the radar. Just organizing one of these "events" and making traffic flow through the parking lot would be a nightmare. You have to recognize that Charlotte, NC is in the middle of the Bible Belt. As I toured Charlotte, most Churches are Christian. I only saw a few Catholic Churches and these were spread out over the entire Charlotte area. St. Matthews is in south Charlotte in an area called Ballantyne. As this article mentioned, this parish started from small humble beginnings. As Charlotte has grown as a hub for major companies and banks, so has newer communities like Ballantyne. I will enter this parish with an open-mind and an optimistic attitude as I join the many ministries that strive to do the Lord's work. As for the size of St. Matthews, 'large' does not necessarily mean distant, unwelcoming or ineffective. It sounds like this parish has many smaller faith and ministry groups that make up this large Catholic community. I praise St. Matthews for visiting and studying the many ways other Christian Churches evangelize. As for the traffic flow and parking lot issue you mentioned, the local police every weekend and on Holy Days ensure that the traffic flow is not onerous. While I cannot attest to how this parish's parking and traffic flow frustrates the parishioners of St. Matthews over a year's period, I am not the least worried about whether this issue would stop me from joining this parish and worshiping Christ. After all, the frustration of traffic congestion is an inconsequential part of our suffering in this life, and patience is a virtue we all need to practice as we strive to love God and neighbor. Apart from large scale operational efficiencies, the theme that most impressed me in the article is that of ministry. It seems indisputable that ministry is the secret to evangelization at any scale. My guess is that is because the essential characteristic of ministry is person-to-person engagement, interest, concern, compassion and acceptance. It takes a happy combination of pastor and parishioners to make effective ministry happen. 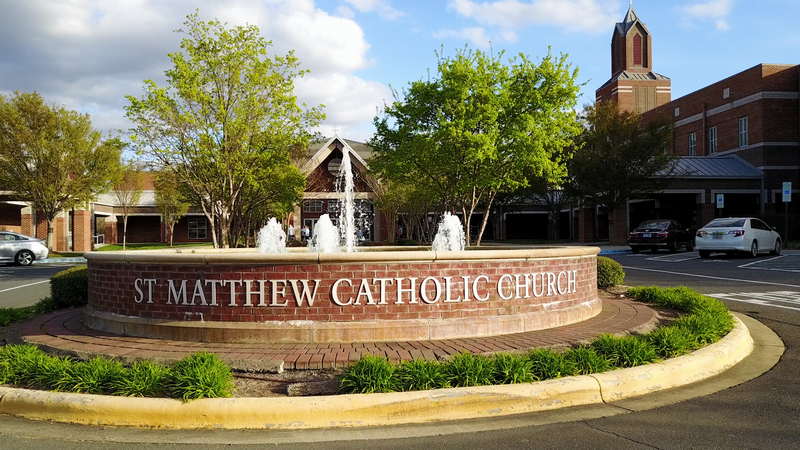 My wife and I have attended Mass at St. Matthews several times on visits to Charlotte and have been amazed and inspired by the liturgy, vitality and welcoming atmosphere. Except for one “but” this is a first rate article. But - in the 3300 or so words “Jesus”, “Christ” and “Christian” do not appear even once. If I knew nothing about the Catholic church and came across this article I’d have no idea that love for Jesus Christ is the motivating force behind all of this. I hope in general Jesus gets more of a break in your articles. This article also appeared in print, under the headline "The Largest Parish in America," in the May 1, 2017 issue. Leah Libresco, contributing editor for America, is the author of Arriving at Amen: Seven Catholic Prayers That Even I Can Offer.